The project will help guide policy makers to improve Trinidad and Tobago's competitiveness, economic diversification and innovation. A Steering Committee comprising representatives from various government agencies and coordinated by the Economic Development Advisory Board (EDAB), Ministry of Planning and Development, is working with the Policy Links team to identify opportunities for diversification beyond oil & gas commodity exports. 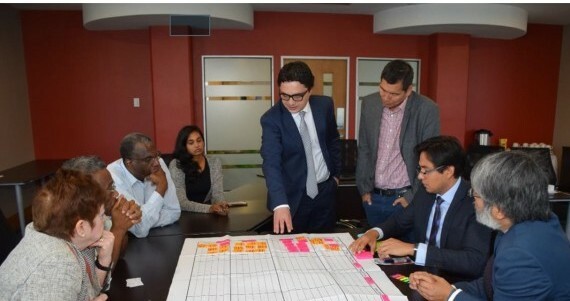 The Cambridge team conducted a number of interviews with local stakeholders from government, industry and academia to both confirm the findings from initial research and to gain a deeper insight into the challenges faced and opportunities available to Trinidad and Tobago firms. The information gathered during these interviews will be used to complement the economic analysis and refine the focus of the subsequent project phases, including the preparation of Landscaping and Roadmapping workshops. These workshops will be held during April 2017 and June 2017, and will seek to build consensus among the key actors, stakeholders and decision makers around specific diversification opportunities for the Trinidad & Tobago economy. The project has been designed to have a direct policy impact. Findings from the investigation will be used to outline the potential contribution of Centres of Excellence to – linked with other policies, institutions and mechanisms – help match current capabilities with the specific opportunities for diversification identified. The Policy Links Unit provides research-based advice and services for technology and innovation policy makers. Part of IfM Education and Consultancy Services, Policy Links is the knowledge transfer unit of the IfM's Centre for Science, Technology & Innovation Policy (CSTI).